(CNN) -- South Korea formally announced Tuesday that it would join a U.S.-led effort to crack down on trafficking in weapons of mass destruction in response to North Korea's new nuclear test. 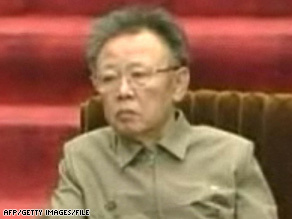 An image from North Korean television on April 9 shows leader Kim Jong Il in Pyongyang. South Korean President Lee Myung-bak's government said it would join the 6-year-old Proliferation Security Initiative because of "the grave threat WMD and missile proliferation is posing to global peace," Foreign Ministry spokesman Moon Tae-young said. The effort is aimed at interdicting shipments of weapons technology, a rare source of hard currency for North Korea, but Moon said the south would continue to uphold a shipping agreement with the north. North Korea previously had protested any move by South Korea to join the initiative. There was no immediate response to Tuesday's declaration, but North Korea's state-run news agency said in April that any effort to join the initiative would be regarded as "a declaration of war." The North Korea's nuclear bomb test -- its second -- reverberated around the world Monday, with the U.N. Security Council condemning it as a "clear violation" of international law and even Pyongyang's closest ally criticizing the exercise. China said North Korea "disregarded the opposition of the international community" to conduct the test. "The Chinese government expresses firm opposition to this," a statement from Beijing's foreign ministry announced. It urged Pyongyang to return to the six-party talks aimed at dismantling its nuclear program, abide by its existing commitments and "cease any actions that might cause the situation to deteriorate further." North Korea agreed in 2008 to scrap its nuclear weapons program, which it said had produced enough plutonium for about seven atomic bombs, in exchange for economic aid. But the deal foundered over verification and disclosure issues, and the North expelled international inspectors and announced plans to restart its main nuclear reactor. At the United Nations, Security Council members took about an hour Monday to express their unanimous condemnation of the move. Russian Ambassador Vitaly Churkin called Monday's test "very serious" and said it "needs to have a strong response." In a statement authorized by the council members, Churkin said the test was a "clear violation" of previous resolutions calling for North Korea to avoid provocative steps such as nuclear weapons or missile tests. And U.S. Ambassador Susan Rice said Washington will seek "strong measures" against North Korea. "The U.S. thinks that this is a grave violation of international law and a threat to regional and international peace and security," she said. France and Japan also signaled support for new sanctions against North Korea, already one of the most isolated nations in the world. Monday's blast, conducted just before 10 a.m. (9 p.m. Sunday ET) showed up on seismographs with the punch of a magnitude 4.7 earthquake, according to the U.S. Geological Survey. U.S. intelligence agencies estimated that the 2006 North Korean test produced a blast equivalent to less than 1,000 tons of TNT, a fraction of the size of the bombs the United States dropped on Japan at the end of World War II. Russia estimated the force of Monday's blast at 10 to 20 kilotons, in the same neighborhood as the early U.S. devices, but the United States said it was still analyzing data from the test. Pyongyang's state-run Korean Central News Agency said only that the latest test was safely conducted "on a new higher level in terms of its explosive power and technology of its control." The North Koreans followed up with a short-range missile launch as well, according to the White House. In Washington, President Obama said North Korea "is not only deepening its own isolation, it's also inviting stronger international pressure." Less than three weeks ago, the White House announced a diplomatic effort to restart the stalled six-party nuclear talks. Several analysts said the test could be an effort to improve Pyongyang's bargaining position or a sign of a power struggle within North Korean leader Kim Jong-Il's government. Han Park, a scholar at the University of Georgia, said North Korea wants normal diplomatic relations and a non-aggression pact with the United States and is "angry enough and hungry enough to sell anything they can put their hands on." Kim is widely reported to have suffered a stroke in August and has been absent from many public functions in recent months. In April, he named his son, Kim Jong-un, and brother-in-law, Jang Song Thaek, to the country's powerful National Defense Commission, suggesting that his son may be his heir. Rebecca Johnson, executive director of the Acronym Institute for Disarmament Diplomacy, said Kim "needs to demonstrate domestically that he is in charge." North and South Korea technically remain in a state of war because no treaty formalized the truce that ended the Korean War in 1953. The conflict also involved China and the United States, and about 25,000 U.S. troops are still based in South Korea. But Johnson played down the prospect of a renewed conflict, saying Pyongyang is "playing a political game."